Noel Moffett (1912-1994) was born in Cork on Christmas Day, 1912. He trained as an architect at Liverpool University and joined Dublin Corporation in 1941 before setting up his own practice in 1944. In 1949 he left Dublin for London. He taught for most of the 1950s while building his private practice, working in partnership from 1956 with his Polish born third wife, the architect Alina Zofia Bolesławicz-Moffett. He came to specialise in social housing for the elderly, mainly for the Greater London Council and charitable trusts. 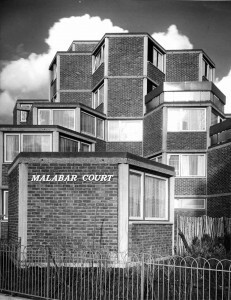 His award-winning Priory Road development in West Hampstead was opened by HM Queen Elizabeth the Queen Mother in 1966 and won a Civic Trust award in 1970. (It was demolished in 2010.) He was the first Head of the Department of Town Planning at Kingston School of Art (now Kingston University), was elected President of the Architectural Association in the 1970s, and spent six years in the mid 1980s in the USA teaching architecture at Iowa State University, the University of Idaho and at Washington State University. He wrote the first in-depth, post-war surveys of architectural recovery across the length and breadth of continental Europe, and in later decades turned his attention successively to developments in the US, Japan, West Africa and Central and Eastern Europe. His last book was The Best of British Architecture, 1980-2000, which appeared in 1993, the year before he died. This exhibition concentrates on Moffett’s time in Dublin in the mid-to-late 1940s, a period during which he emerged as a leading Irish pioneer of modern architecture. His near contemporary Kevin Roche remembers him at the time as ‘an extraordinary person’ who was ‘a very exciting presence on what was then a very dull architectural scene’. 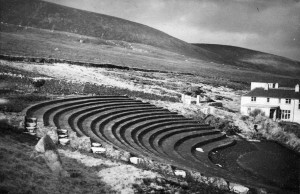 Schemes such as the Open-Air Theatre, Achill, Co. Mayo, or the proposed factory for Miami Squashes, Dublin, show the diversity of his interests but housing featured strongly from the start. 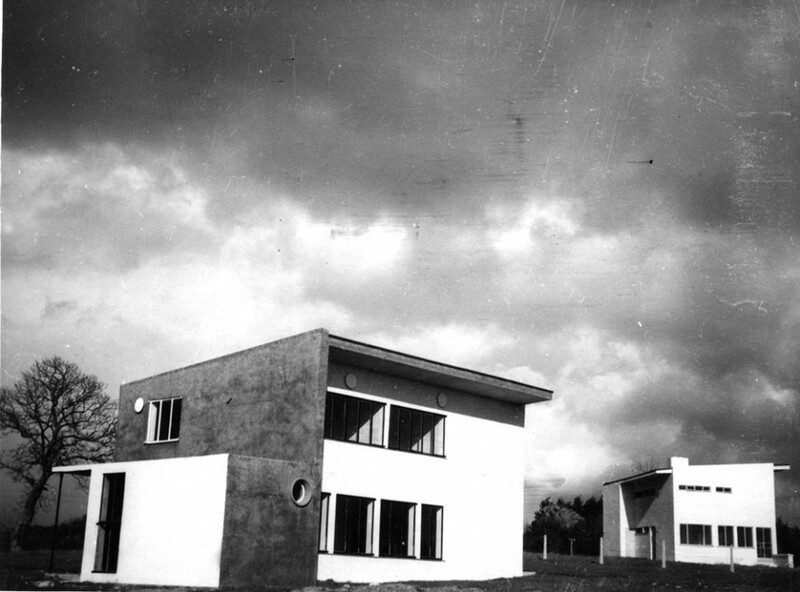 His East and West Houses, Portmarnock, have been described as ‘very daring’, reflecting distinctly ‘the works of the great housing masters, Gropius and Maxwell Fry’, while his scheme of local authority housing for Dundalk Urban District Council was exceptional for the variety of house types, the open-plan ground floors and the bold use of colour throughout. This scheme prefigures Moffett’s architectural career in London, where low cost, high-density, public housing became a mainstay of his practice, including many schemes developed using a hexagonal modular plan inspired, according to Moffett, by the Giant’s Causeway. 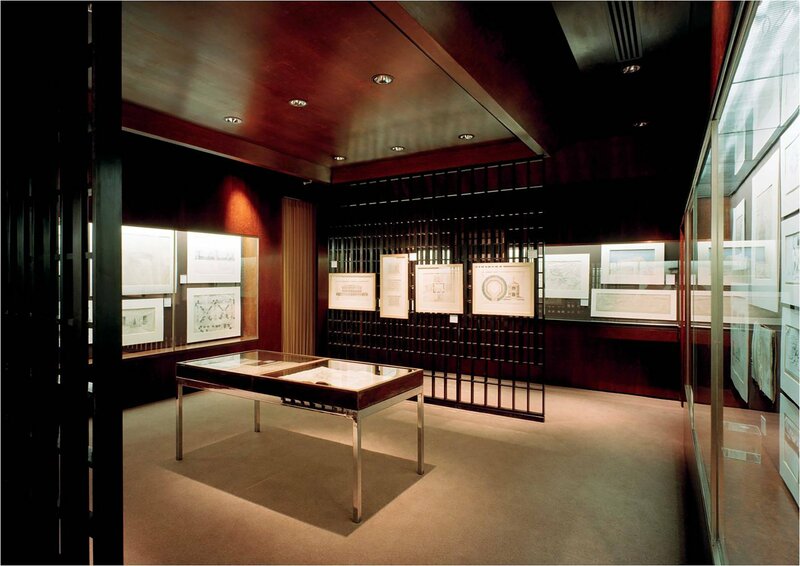 Moffett’s unambiguously Modernist buildings were clearly influential but his presence was also felt in other ways. He designed several exhibitions, promoted an interest in prefabrication and innovative building solutions through the Tomorrow Club, was involved (with his first wife Margot) in the White Stag group of artists and ran a private architecture school, an early expression of his lifelong commitment to teaching and to students. The landmark July 1947 issue of the British journal Architectural Design was guest-edited by Moffett and gave a seal of international approval for the first time to contemporary Irish architecture. Several of those who worked with Moffett, for him or encountered him in Dublin in the mid-to-late 1940s went on to enjoy spectacular careers at home and abroad, including Liam Carlin, Paddy Delany, Patrick Hamilton, Reginald Malcomson (a close collaborator who joined Mies van der Rohe at the Illinois Institute of Technology in 1947 and was invited to work in his office), Herbert Unger, Robin Walker and the aforementioned Kevin Roche. A favourite piece of introductory advice offered by Lionel Budden, Roscoe Professor in Architecture at Liverpool University to his students, including Moffett, was ‘this is your restless pencil. Take it with you everywhere you go’. It was advice Moffett took fully to heart. He had travelled widely as a young man, making a seminal cycling trip through Germany, Czechoslovakia and Austria in 1935, and even visiting Jamaica in 1936, and sketched constantly throughout his life, using the drawings for teaching, exhibitions and publications. And it was his restlessness which took him from Dublin to London and beyond. 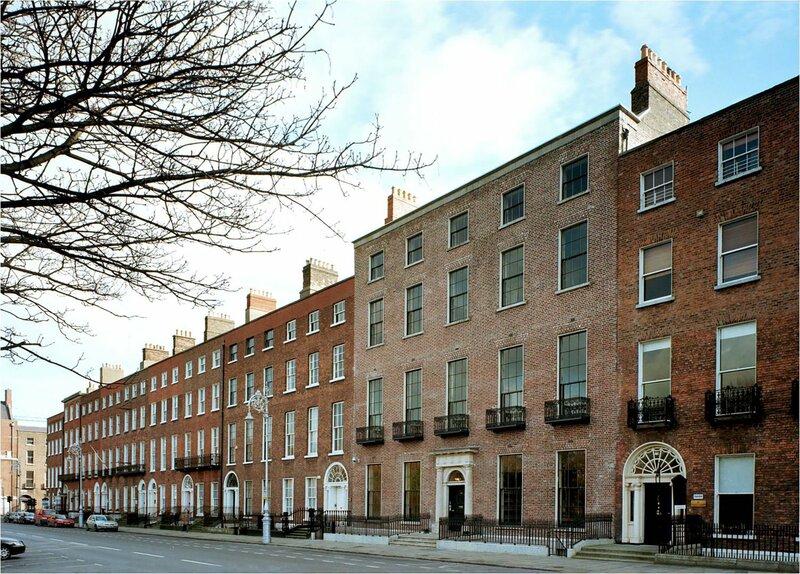 Short as his Dublin career was – relatively few of his buildings were actually constructed and none exist in their original state – Moffett remained a figure of interest to Irish architects. In 1967 a call was issued by the Irish Builder and Engineer to have him recalled to Ireland and made Dublin City Architect. 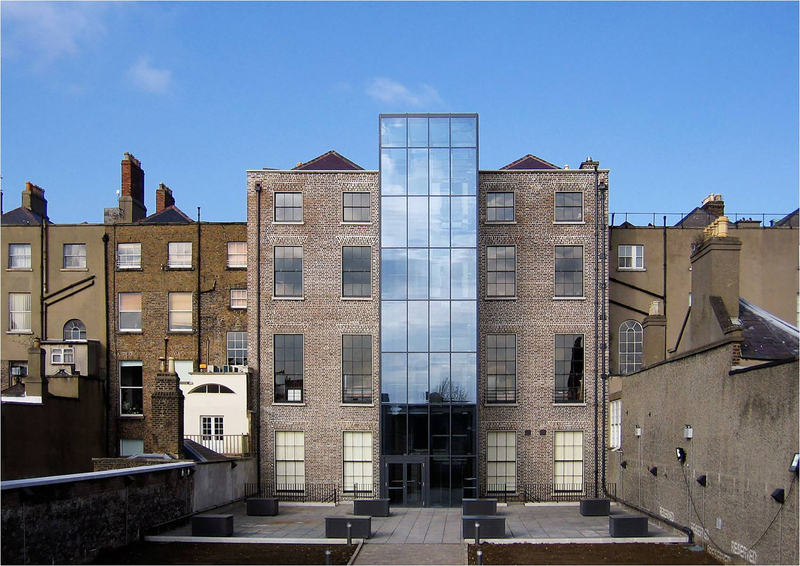 This fell on deaf ears and it was not until 1990 that Moffett’s legacy was fittingly acknowledged when he was made an Honorary Member of the Royal Institute of the Architects of Ireland. A lecture series will accompany the exhibition in January and February 2013. Details can be found here. The Irish Architectural Archive would like to thank Shane O’Toole for his curation of this exhibition and lecture series. The Archive also acknowledges the support provided for the exhibition by the Department of Arts, Heritage and the Gaeltacht under the Government Policy on Architecture.